CRIME, GUNS, AND VIDEOTAPE: Los Angeles is Under an Arson Siege. Is this Terrorism? Los Angeles is Under an Arson Siege. Is this Terrorism? Los Angeles, CA—In a world where the word terrorism is misused to describe schoolyard children threatening each other there are real threats. Our government has been using scare tactics to justify eliminating privacy and liberty exactly like Nazi regime did during the Third Reich. Josef Goebbels and Obams’s former Chief of Staff Rahm Emanuel both understood the power grabbing benefits of crisis exploitation. 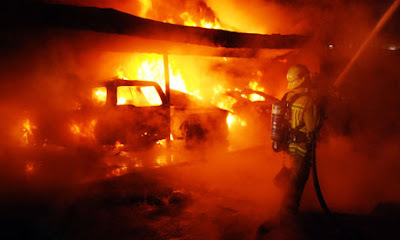 What’s very real here are some 40 similar arson fires apparently started in building carports. The fires include Hollywood, West Hollywood, Sherman Oaks, Burbank Sun Valley and at least one on the Westside of L.A. If this is the product of a single arsonist he is prolific, busy and very dangerous. Today they released a grainy video of an older heavy, pony tail wearing, White male with a resemblance to the legendary rocker, Meatloaf. 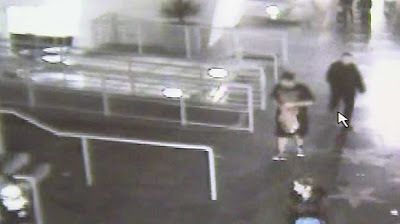 Police say unknown subject is a “person of interest”. Cops also say the same subject has been seen at more than one of the arson fires. Arson is a peculiar crime that can have numerous motives including sexual release. Revenge, insurance fraud or an attempt to cover-up some other crime are the most common motives. Arsonists leave signatures behind and that’s usually their undoing. We are in age of video surveillance and police may have much more incriminating video of their ‘person of interest” they are ready to disclose. Details of the method used to ignite the fires ,is being kept secret by police as not to taint the interrogation process should they bag a suspect. Video surveillance cameras are cheaper and better than ever and should be freely used by property owners. It’s important to keep carport areas free from rubbish and flammable materials. Motion detectors that activate lights and alarms are advisable. Vigilance is important. There are never enough police to prevent crime. Every state allows the use deadly force to stop an arsonist. You don’t need to make demands he stop the attempt before you shoot. Shooting an arsonist is generally a good idea but confessing such an event to police is not. Terrorizing and Terrorism are not mutually inclusive. That won't stop the knee-jerk politicians from overreacting in the name of "doing something".